Frank and I have returned to Canada, Frank on January 30th and myself on Feb. 7th. My report on my last week in Tanzania begins on a Sunday, with the sorting of school uniforms and supplies. Our children had been advised to come that Sunday afternoon to Joseph’s home to pick up their school uniform and supplies. Six-year-old David arrived first with his grandpa and they arrived at lunch time. There was no doubt that they would be invited to stay and join us for the noon meal. Joseph’s mom heartily welcomed two more to the small garden where we ate. 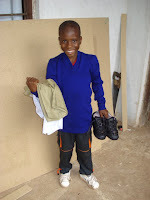 As you can see in the photo, David was delighted to receive his uniform and school supplies. After lunch it rained very hard and Scola was the only additional arrival. Scola luckily had an umbrella which is a rare sight amongst our children and raises an issue that we would like to address before our next return trip. During the rainy season children arrive at school wet and stay in those wet clothes all day. The typical protection from the rain is a banana leaf, which does little to keep them dry. Subsequent days were spent reviewing each child’s file to ensure that we had updated information, a new drawing and the necessary receipts for all support costs. On Wednesday Joseph informed me that little Airini, who was transferred to the KCMC hospital in Moshi with a diagnosis of malaria, actually had appendicitis. She was now at home and doing well. And little Yasinta, another child with a health issue (we had paid the $2 clinic fee for her to be seen by a physician), had been turned away from the clinic. The physician had not realized that her clinic fees had been prepaid by ABCD. Another issue to add to Joseph’s “follow up” list of things to do. 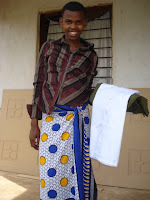 Josphat, the 14-year-old boy from Kenya was not able to get admission to the local government-sponsored high school because he was not from Tanzania. His only option now is one of the private schools. Joseph will follow up with Josphat to determine if this would be of interest to him. When I left Tanzania on Friday, Joseph’s follow-up list was long indeed. With 10 new children added he has much to do! Where would we be without him.